Lamas, Book 2, builds on Lamas, Book 1, and describes continued training and care for lamas. 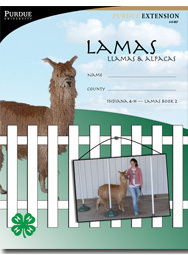 Among other things, you learn about lama registration papers, lama communication, differences between llamas and alpacas, lama feed, lama training, lama showmanship, and using lama fleece. This 48-page manual is appropriate for youth in grade 6-8.